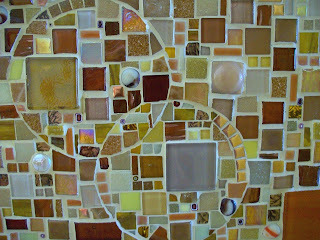 This is a partial view of one of my first mosaic projects - a wall panel that was about a foot wide and five feet high. The client wanted me to incorporate pieces from a box of costume jewelry and odds and ends that she had collected over the years. It was an intriguing project, because it evolved in a very organic and unplanned way. That process often works best for me, because when the finished forms are spontaneous, they have a freer look and feeling than when I plan something out in detail. 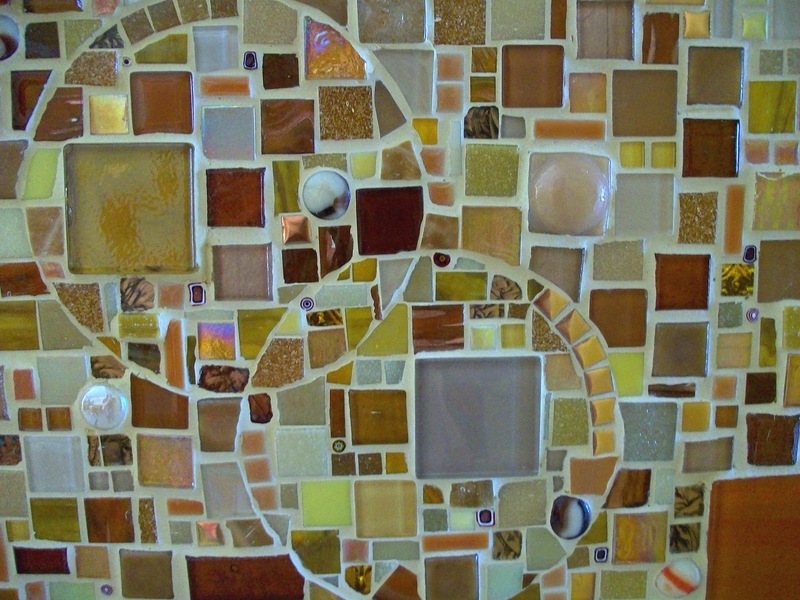 Grout can make or break a mosaic work; and the color can either enhance or fight with the finished work. Usually a medium gray is a good choice, because it fades to the background. 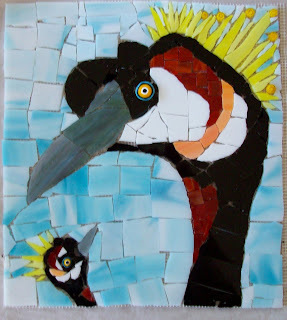 I use black if I want the mosaic to really stand out, and sometimes other colors if I want the grout to contribute to the final effect. 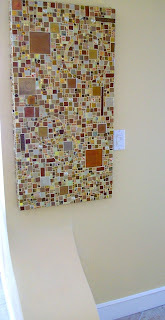 Grout can be mixed with pigments to make any color you want. 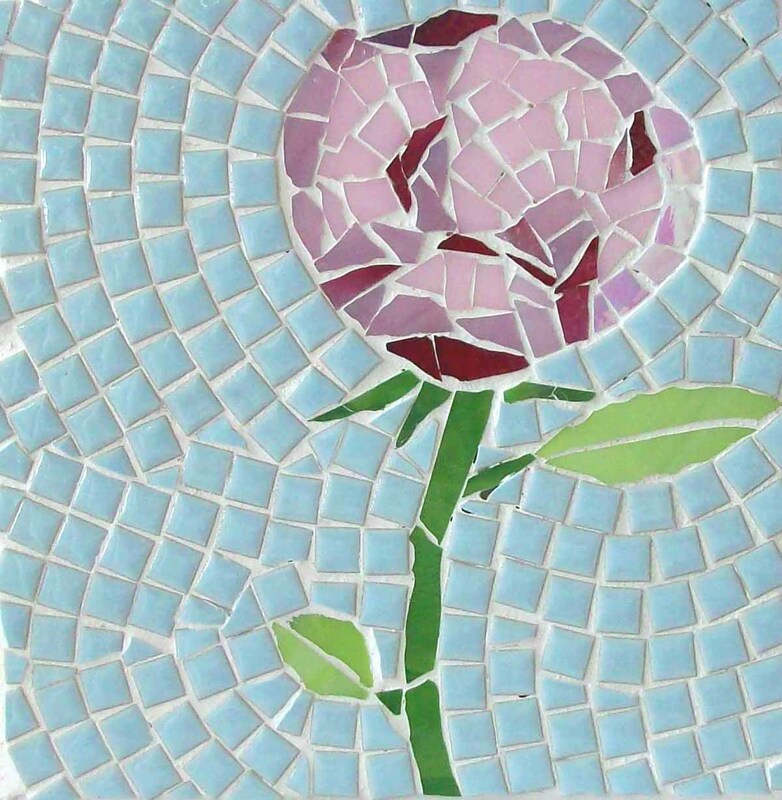 I recently learned of a good tip for deciding which grout color to use; it came from a fellow member of SAMA, the Society of American Mosaic Artists. 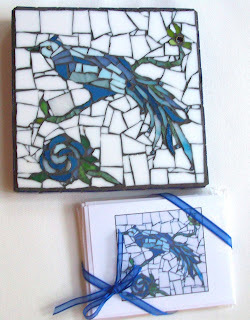 Many of the books say to do test pieces, but if that's too much time and trouble (and it usually is for me, being someone who likes to work quickly), you can simply sprinkle a little powdered grout of different colors over your finished piece, and you will immediately see which color is going to work best. Circles and Squares - installed! 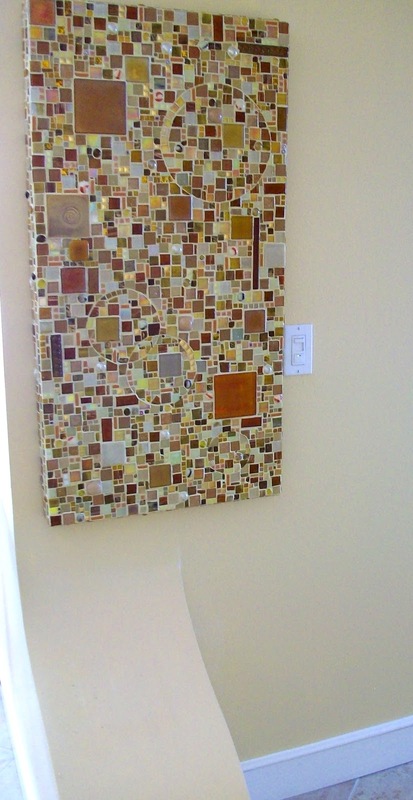 This morning I installed the mosaic piece to cover an electrical panel in my client's hallway. It turned out even better than I imagined. As you can see, the hall has a handy bump-out right below the panel, so no one will accidentally bump against it (I have no idea what it's really for!). The installation is not quite perfect, because the wall has a slight bow to it, so the piece does not sit perfectly flat against the wall. Nothing I can do about it, so I won't worry, but I do like to have things turn out as perfectly as humanly possible! Below is a close-up. I love how the circles show up now that it's grouted. The grout color is called "Harvest Yellow," and it turned out to be pretty darn close to the wall color, a Benjamin Moore color called Wheatfields. Normally I prefer darker grouts, but in this case, I wanted to match the wall color as much as possible. There is so much light in the apartment that it shows off very well. I did enjoy doing this piece, but I will also be very happy to move on to the next project. Last weekend I completed this mosaic to contribute to a project being organized by Eve Lynch of Kraken Mosaics in Fort Myers. 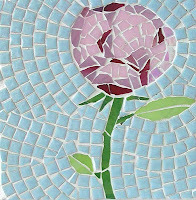 She put out a call for contributions of mosaics to include as part of the outdoor environment for the J.H. Messina Children's Center in Fort Myers. My inspiration was a particular species of crane - the black-crowned - but after finishing it I realized that it also could have come right out of a Dr. Seuss book. Mosaics for charity is, of course, not a new concept. I recently learned of a nonprofit called Piece by Piece, which teaches disadvantaged adults to create mosaic works of art to sell for extra money. Their slogan is "Recycled art for a new cycle of life." They make the analogy that life itself is a process of putting together bits and pieces to make a whole person. The organization is headquartered in Long Beach, California, and some of the works being created are extraordinarily beautiful. This is another of the small pieces produced from shelving remnants - first in a series of "flower portraits." It's about 7 inches square. I experimented in this one with combining stained glass - in the bud, stem and leaves - with glazed ceramic tiles in the background. I think it gives a starker, yet effective, background, and shaping the tiles to follow the line of the rounded bud - the Italians call this "andamento" - makes it seem to jump off the page. I plan a series of these, and a local gallery has expressed interest in showing them. My inspiration for the flowers was looking through a stack of drawings I did many years ago when I was on a watercolor kick. In college I had concentrated in Drawing, so in a lot of works I combined pure line with partial bursts of intense color, in either colored pencil or paint. 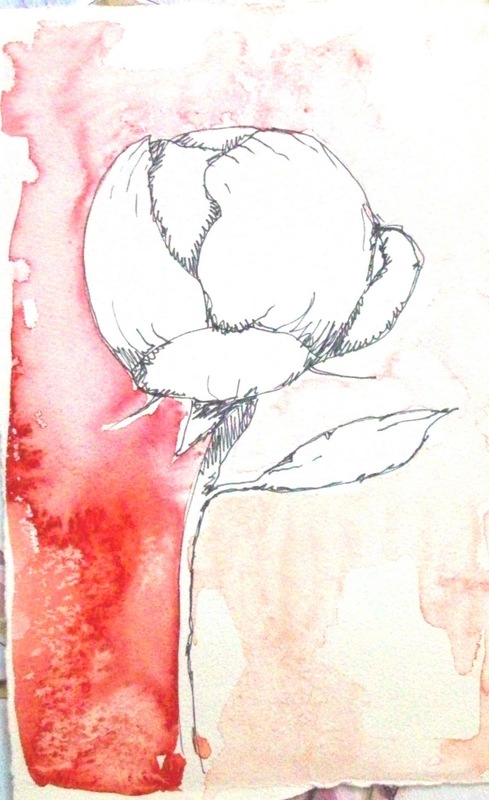 This is the peony sketch that inspired the mosaic. A friend's daughter is getting married this weekend, and I wanted to do something special instead of simply checking something off the registry list (besides, I could afford probably one teacup, which wouldn't be very useful!). This small mosaic is about 7 inches square, and it's inspired by the couple's china pattern, a Jasper Conran design called "Chinoiserie." I printed out a few notecards to match, and tied everything up with a blue bow. I've always felt that handmade presents are so much nicer than store-bought things anyway. It's like giving a bit of yourself along with the object, and strengthens the bonds of blood and friendship. Parents know this; witness the hordes of refrigerators across the world plastered with little ones' paintings and drawings!